While many elements of fire safety in a condo are similar to a single-family home, there are differences, notes Ottawa Fire Capt. Jim Gervais, right, shown with crew members, from left to right Keith Ellis, James Tickell and Dave Sim. OTTAWA — Do you know what to do if there’s a fire in your condo? Though there are codes to ensure buildings are constructed to a high standard of safety, there are other things you can do as a condo resident to ensure you and your family are prepared for a fire emergency. 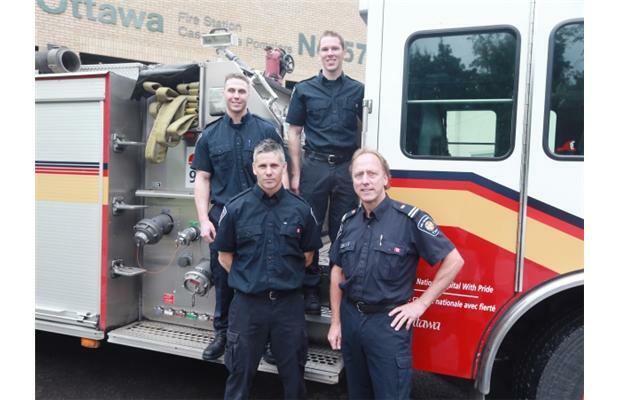 Ottawa Fire Station 57 is conveniently located one door away from my office so I took the opportunity to interview Capt. Jim Gervais about how to prepare for the unlikely event of a condo fire. There’s little difference between a single-family residence fire and a condo fire in terms of where they originate, Gervais says. The most common cause is unattended cooking and the most common area of origin is — you guessed it — the kitchen. In condos and apartment buildings, 70 per cent of fires start in kitchens, five per cent in bedrooms, four per cent in areas of egress and the remainder in garbage, garages and locker rooms. 1. Know all the exits from your floor, in case the nearest one is blocked by fire or smoke. 2. Talk to your superintendent and/or condo board and know the emergency procedures outlined in the building’s fire safety plan. Learn about the fire safety features of the building — fire alarms, voice communication and evacuation procedures. 3. Select a fully sprinkler-protected building to live in. If your building is not so protected, ask the condo board to consider installing a sprinkler system. 4. Make sure all exit and stairwell doors are clearly marked, not locked or blocked by security bars and clear of clutter. Report any issues to the building superintendent or the fire department. When do most fires occur? December, says Gervais. And that goes for all residential buildings in Ontario, not just condos. It’s the month with the greatest number of fire fatalities. Is your condo board ready? The board should maintain fire safety features including “sprinklers, alarms, fire separations, door closures and knowledge of their updated fire safety plan,” he says. Gervais’ safety advice for builders? “Don’t just meet the minimum building code or fire code requirement. Protect your investment; install the best sprinkler system. A fire department-only access lockbox on the exterior of the building will give quick access to important building areas” in case of emergency. It’s 7 p.m. and your neighbour’s smoke alarm goes off. Maybe he or she is just cooking. We’ve all set off our alarms when we’ve forgotten to use the hood fan or it just isn’t doing its job. But don’t panic; wait to see if your neighbour is able to resolve the problem. There have been many deaths in nightclub fires over the years due to people getting overly anxious and swarming the exits, and then being unable to get out. Is there a similar danger with condo buildings? Gervais says this is not a big problem with condo fires. Of course, adding alcohol into the mix (at nightclubs) doesn’t help. You may think Gervais’ advice is equally applicable to your place of business. This is somewhat true, though not entirely. 1. Don’t panic, decide immediately if you are to leave or stay in your unit. Usually the best thing to do is leave the building as soon as possible. If you do not or cannot leave the building immediately, you must protect yourself from smoke, says Gervais. 2. When you leave, take your keys, feel every door you encounter (including the one to your unit) for heat, and open slowly. If it’s safe, proceed. If at any time you encounter heavy smoke, find another exit or return to your unit. 3. Remember, wherever you are, if there is smoke, get low and go under the smoke to safety. The air is cleaner near the floor. Though it’s unlikely that you will have to worry about a fire in your new condo, it’s important to be prepared. Fires can take you unawares and you should be well versed in the fire safety plan specific to your unit and building. Why not address fire safety at your upcoming condo board meeting?